Arianespace have launched another two satellites – Alphasat and Insat-3D – via their Ariane 5 ECA rocket. Launch from the European Spaceport in Kourou, French Guiana was on schedule at the opening of its 79 minute window at 19:54 UTC on Thursday. This mission was designated Flight VA214 in Arianespace’s launcher family numbering system and was the 214th launch since operations began with the Ariane series of vehicles in 1979, as well as the 70th flight for the heavy-lift Ariane 5 version. 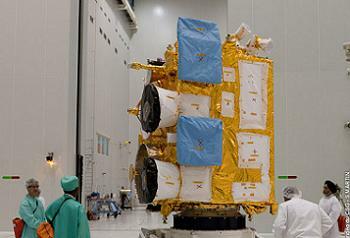 The launcher had India’s INSAT-3D satellite installed in the lower position of its payload “stack”, with Europe’s Alphasat as the upper passenger. The payload lift performance for this mission was 9,760 kg., which included a combined total of some 8,770 kg. for the two satellite passengers, as well as the launcher’s SYLDA dual-passenger dispenser system and satellite integration hardware. Alphasat is Europe’s largest telecommunications satellite ever manufactured and results from a large-scale public-private partnership between the European Space Agency (ESA) and Inmarsat. 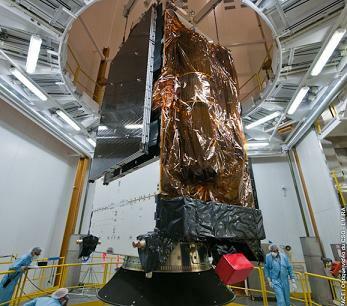 Built by prime contractor Astrium, it is the first flight model of Europe’s Alphabus high-capacity satellite platform, configured with a new-generation L-band geo-mobile mobile communication relay system and four technology demonstration payloads for ESA. Alphasat will expand the UK-based Inmarsat operator’s global mobile telecommunication network – delivering new capabilities in terms of performance and resource availability, providing 50 percent more accessible spectrum with double spectral efficiency and nearly 20 percent more channels. The satellite’s solar array will span nearly 40 meters once deployed in orbit, generating more than 12 kW of power. INSAT-3D was developed by India’s Indian Space Research Organisation (ISRO) space agency and its ISRO Space Applications Centre, designed to provide meteorological observation and monitoring of land/ocean surfaces. The satellite – which is adapted from India’s I-2K spacecraft bus – is equipped with a six-channel imager and 19-channel sounder, as well as a data relay transponder and a payload for satellite-aided search and rescue operations. Once fueled, INSAT-3D had an estimated lift-off mass of 2,090 kg, and features eight new-generation digital signal processors and an 11-meter antenna reflector. It also is configured with four technology demonstration payloads for ESA. the subsequent separation of INSAT-3D to complete the Arianespace mission 32 minutes after lift-off. The previous Spaceport missions performed by Arianespace so far this year were the June 25 medium-lift Soyuz launch that orbited O3b Networks’ first four connectivity satellites; an Ariane 5 flight on June 5 with Europe’s fourth Automated Transfer Vehicle, which was Ariane’s heaviest payload ever; the May 7 lift-off of Vega on this lightweight vehicle’s second flight, carrying the Proba-V, VNREDSat-1 and ESTCube-1 satellites; and an Ariane 5 mission on February 7 with the Amazonas 3 and Azerspace/Africasat-1a passengers. Completing the 2013 activity to date was a Soyuz launch from Kazakhstan’s Baikonur Cosmodrome on February 6, conducted by Arianespace’s Starsem affiliate with six second-generation Globalstar satellites. It marked the fourth and final mission currently contracted by Globalstar with Arianespace/Starsem for the deployment of its second-generation satellite constellation.